So reading, “A Thousand Rooms of Dream and Fear” by Atiq Rahimi was a part of my reading project – “Around the World Reading”. The series of books that I plan to read first are either based in Afghanistan or written by Afghan origin writers, this being one of them. I had read “The Patience Stone” by Atiq Rahimi last year and loved it. This year it was this one, another novella by Rahimi, set in Afghanistan. “A Thousand Rooms of Dream and Fear” is set in 1978-1979, Kabul, Afghanistan. It is just on the brink of the Soviet War in Afghanistan. The novella is written from a stream-of-consciousness perspective and yet it is just not the narrator’s version or his take on things. There are more layers to the story. A man is found outside a woman’s house – beaten and bruised. The woman takes him into her house. She has a child and another man whose identity is not revealed for a while. The entire drama unfolds in the lady’s house and in the mind of the narrator. The stream of consciousness is strong throughout the novella. The past and present intertwine beautifully in Rahimi’s words. The plot is threadbare and yet holds so much action in it for a novella. The reader wants to know more and is at the same time satisfied with what is served. “A Thousand Rooms of Dream and Fear” is complex most times. It will not be an easy read. The story elucidates the concepts of freedom, hope, and love. It might take you some time to get into the book, but once you do, it will want and demand complete attention. I highly recommend this read if you want to know more about Afghanistan’s political landscape. This entry was posted in Afghanistan, Around the World Reading, Books, Literary Fiction, Other Press, Review and tagged A Thousand Rooms of Dream and Fear, Afghanistan, Around the World Reading, Atiq Rahimi, Kabul, literary fiction, Other Press, Russians on August 16, 2014 by thehungryreader. This site is owned and run by Ann Morgan (@annmorgan30 on Twitter), a freelance writer and sub-editor. She took on the project of reading books around the world. A book for each country in the world. So there were 196 books for 196 independent countries. I read the posts on her site and could not help but take on the same project. She made it easier for me by providing me with a list. The question now is whether to read everything listed by her or read what she picked or create my own list. I think I will do a bit of all. The list will be perfect. Another reading challenge. The challenge will start from today and I am super excited. 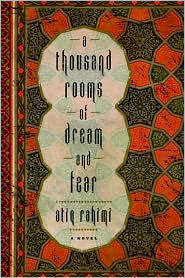 Starting with “A Thousand Rooms of Dream and Fear” by Atiq Rahimi. This entry was posted in Around the World Reading, Books and tagged Afghanistan, Ann Morgan, Around the World Reading, Cultures, reading, World on August 10, 2014 by thehungryreader.